customize with a 16mm cabochon. 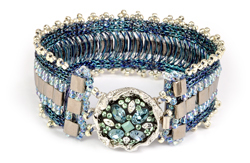 Features the Rotunda Clasps with a custom cabochon using epoxy clay and SWAROVSKI ELEMENTS. For instructions click here.